By Nick Ostdick. Apr 6, 2016. 9:00 AM. 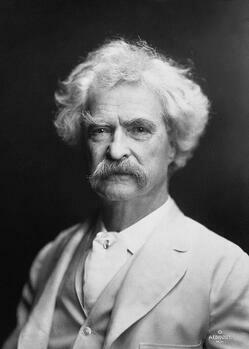 When you hear the phrase ‘great American novel,’ a few titles immediately jump to mind. The Grapes of Wrath. The Great Gatsby. Catcher in the Rye. But long before these classic novels helped redefine what is meant by the ‘great American novel,’ Mark Twain’s The Adventures of Huckleberry Finn defined the term in such a way that the novel is still regarded today as perhaps one of the most seminal works in the American literary landscape. First published in the United States in 1885—the novel was actually released in December 1884 in the U.K.—The Adventures of Huckleberry Finn chronicles the title character’s fortunes and friendships in Missouri and neighboring states along the Mississippi River. Often referred to as one of Twain’s most complete pieces of satire of the American South and its inhabitants, the novel is a direct sequel to The Adventures of Tom Sawyer and was one of the first novels to incorporate regional language and dialect into the narrative and dialogue. But perhaps one of the novel’s most interesting aspects is the physical book itself, or rather the handful of early, rare, and illustrated editions that somehow manage to elevate this famed literary work. With that in mind, here are three editions of The Adventures of Huckleberry Finn that are sure to delight book collectors and readers alike. Released in celebration of the 100th anniversary of the original publication date, Barry’s Moser’s illustrated edition of The Adventures of Huckleberry Finn takes the fine art of book illustration to the next level. With only a few hundred copies printed, this edition features 49 hand-signed, wood engravings depicting key moments and scenes throughout the novel. Moser, a noted printmaker and illustrator, has provided original and unique renderings for a number of classic novels and stories, including Alice’s Adventures in Wonderland and Through the Looking Glass. In further commemoration of the 100th anniversary, this edition also features a forest-green cover and gold lettering on the front and spine as a nod to the original color and lettering used in the 1885 first American edition. 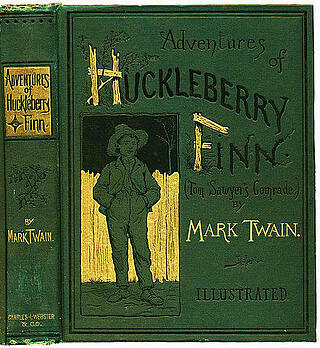 The first American edition of The Adventures of Huckleberry Finn was published in 1885 by New York’s Charles L. Webster and Company, Twain’s own publishing house. The book was originally scheduled for release in December 1884, but problems with printing and illustrations delayed the U.S. release until 1885, which angered Twain as he hoped it would be available for the Christmas shopping season. 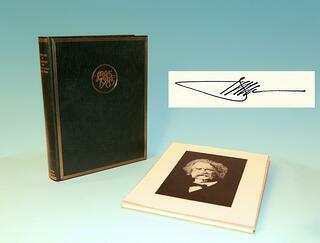 This edition features 174 black and white illustrations from American illustrator E.W. Kemble, whom Twain personally commissioned for the project. Earliest printings of this edition feature a dark green cloth cover and binding with a cartoon-esque likeness of Finn standing in front of a picket fence. This edition also came in a variety of bindings, including library, half morocco, and cloth, which is by far the most common. You may not think a simple change in the color of the cover could vault an edition to a highly collectible level, but that’s exactly what happened with The Adventures of Huckleberry Finn. Released at roughly a similar time as the first edition green cover, the blue cover version is nearly identical in scope: cloth cover (with the variances in terms of binding); depiction of Huck Finn on the front; font that incorporates artistic renditions of wooden planks used in picket fencing; and 174 illustrations by Kemble. Whereas the green covered iteration is referred to as a first edition, first issue, the blue covered version is commonly known simply as a first edition. But what separates the blue covered edition and makes it such a white whale for book collectors is how few of the blue editions were released. Industry insiders quibble about the number of copies published and where a majority of them were distributed, particularly given the commonly-held reason why the blue covered was discontinued. Though substantiations have not been made, many believe the blue cover was discontinued after sales of this edition declined severely in the post-Civil War South in some regard due to the similarity between the cover and the color of the Union army uniforms.